Juvederm Vollure is part of the Juvederm family of facial fillers, which includes Voluma, Ultra Plus, Ultra, and Volbella. 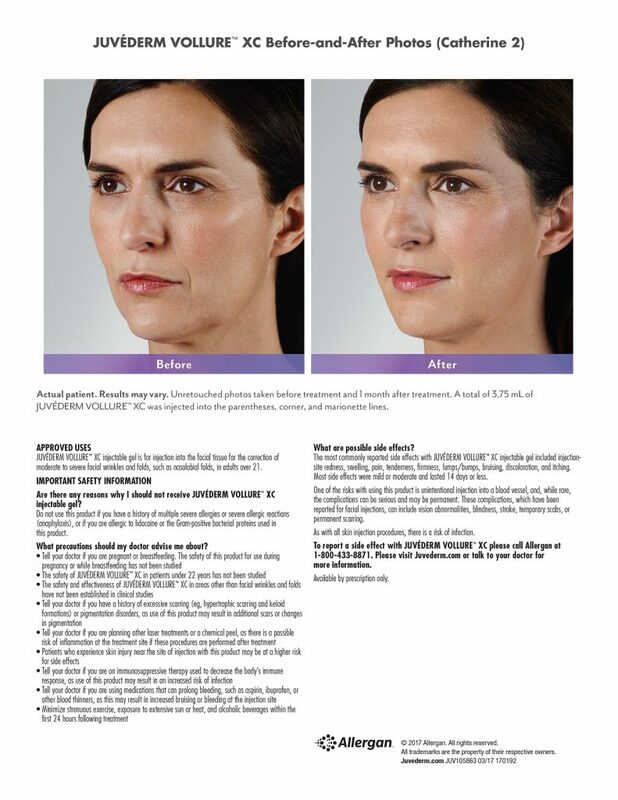 Juvederm Vollure is approved for the treatment of nasolabial folds, and is proven to last up to 18 months. It is a form of hyaluronic acid, like the other Juvederm products, but it uses a different type of cross-linking, termed Vycross technology. This makes Vollure softer and more pliable, yet able to hold its form. Vycross technology is also used in Volbella. Juvederm Ultra, Juvederm Ultra Plus and Juvederm Vollure can all be used to treat the nasolabial folds. Juvederm Ultra and Ultra Plus provides more deep lift, and are firmer than Vollure. Vollure is best used for more superficial lines. Layering Juvederm Vollure over Juvederm Ultra or Ultra Plus can be a very successful strategy. How is Juvederm Vollure injected? Juvederm Vollure is injected in the same way as other fillers. For the nasolabial folds, it can be injected using a cannula technique, or using a needle, depending on the physician’s preference. What are the side-effects from Juvederm Vollure? The side-effect profile for Vollure is similar to other hyaluronic acid fillers. The main concerns are tenderness, bruising, swelling, lumps and bumps. 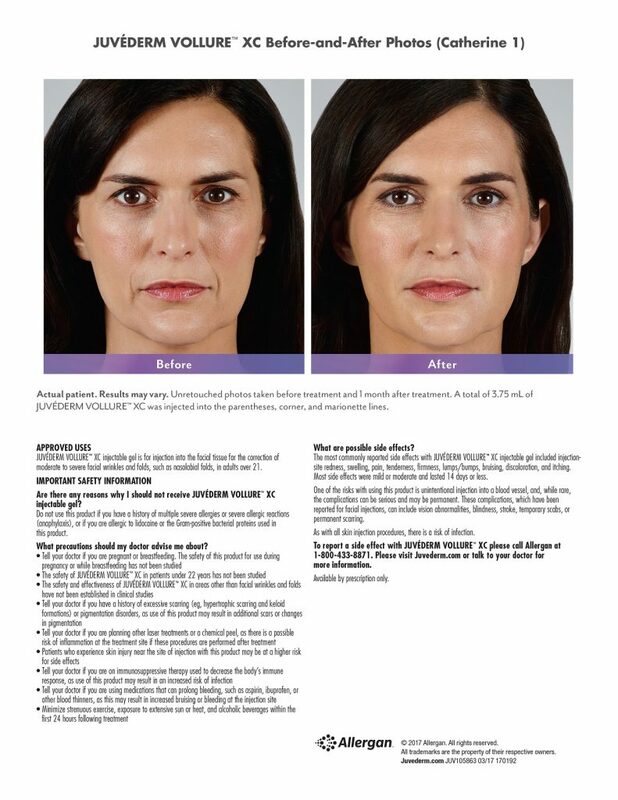 See the informational insert from Allergan for further information and a full description of adverse events. Most side-effects, should they occur, resolve on their own. Topical ice can be applied prior to injection, or topical numbing. The injection itself is mildly uncomfortable. Vollure has the topical anesthetic lidocaine mixed in, so as injection proceeds, the area grows numb. How many syringes of Vollure will I need? In the clinical study for correction of the nasolabial folds a median volume of 1.7 ml was used per side. In clinical practice, most people use a total of 1 or 2 ml for their treatment. Can I use Vollure with other fillers? You can combine Vollure with other fillers. For example, you can use Juvederm Ultra Plus or Juvederm Ultra for deep folds, followed by Vollure for more superficial lines. It is always a good idea to inject Voluma in the mid-face before correcting the nasolabial folds. If necessary hyaluronic acid fillers can be dissolved with the enzyme hyaluronidase. This is sometimes necessary to correct a complication or resolve asymmetry.